We are heading towards Kilimanjaro along the road C102. Police officers at the roadside station ensure us that we are unlikely to come across dangerous animals at this time of a year. On the way we pass scattered tiny villages with inhabitants taking care of their cattle. It’s nearly the end of the dry season, so we encounter dry riverbeds, empty lakes and even ponds at the bottom of which some weeds already started to grow. Sometimes there is a bit of muddy water left and being the only option in the area, it attracts thirsty animals. Forget these tiny settlements, the whole area is absolute wilderness. We jump at the opportunity to be alone and cycle off the main road into the bush to find unique, secluded place to pitch a tent and enjoy a view of the summit of Africa. In the morning there is an unexpected surprise. Three out of four tires in our bikes are flat. A detailed analysis reveals that several barely visible thorns and spikes have cut the inner tube. The repair takes around two hours, however the view of Kilimanjaro in the background nearly compensates for the hassle. We arrive to Oloitokitok and start preparing for roughly 5-day long section of our trip which will take us through the least populated part of Kenya. We find Mwanzi Safai Inn and get a hotel room for $8. It’s an opportunity to make a big laundry, take a shower and patch invisible holes in our tubes using a bucket of water to locate them. Signe has already counted thirty-seven punctures during this trip. Among other statistics, we have more than 1,500 km of distance and 100 hours of net cycling. During the night I have some very strange dreams. Maybe it’s because this is the first hotel we stopped at on our way? We take the road going just along the Kenyan-Tanzanian border. This is a perfect chance to take a break for Kilimanjaro (Tanzanian beer) and Serengeti (another Tanzanian beer). In Rombo we wait through the rain. A few kilometers further we get to know Elizabeth, a young Masai woman, who invites us to her village to spend the night. “Supa” means in Masai “hello”. We agree that we continue cycling another ten kilometers while she would take a bus and await us at the sign Njukini Dispensary, visible from the road. The plan works. We walk our bikes and follow Elizabeth along a narrow for another two kilometers into the bush to the village Oloburi Soit. where she lives. This village has neither access to water nor to electricity. Elizabeth introduces us to her family and the families of her husband’s brothers. We visit the area. She shows us traces of three unsuccessful attempts to build a well. The village is fenced with a pile of dried thorny branches to protect their huts and cattle against wild animals, in particular, against elephants in rainy season. Elizabeth, twenty-three, is Masai dressed in a modern style. It clearly stands out comparing to the other women in the village wearing shúkà, colorful sheets worn around the body. According to the Masai revised tradition, an educated Masai woman has the right to choose how she would dress and which customs of other cultures she would adopt into her everyday life. Decorations in the ears, around the neck and on hands are worn rather for a special occasion. To emphasize tribal ties, Masai would pull their descendant’s lower middle tooth. Similarly, often already year-and-a-half old children are marked with a glowing metal symbol pressed against their cheek. It is a ritual that is used still nowadays, but more and more families gradually start to abandon it. The hosts invite us outside so we can see the procedure step by step. First, the goat is strangled, then cut in several points and by precise movements of knife, the skin is peeled. Each part is individually taken care of. 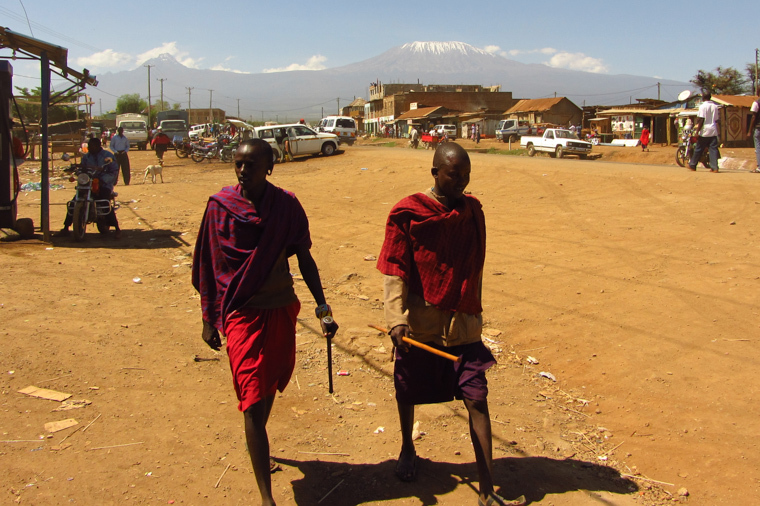 Women holding a traditional Masai outfit are not permitted to participate in the process. They would see the meat only after men bring it to them. Some parts are specifically meant to be consumed by women, other parts are for young children, for father, for visitors and so on. The host cuts off with his knife something which looks to me like a kidney. He holds it in his hand and looks in our direction. I start to realize what is going to happen and it scares me a bit, because I usually do not eat raw kidneys. Luckily, a little four-year old boy comes to save us. The enthusiasm on his face suggests that he, not us, deserves the “special” piece. The kidney is cut in half with a knife and, as warm as the animal’s body temperature, swallowed at once by the boy and his father. Meat pieces, ribs and liver are roasted on fire. Children look after the fireplace in the dark and one of the adults is taking roasted pieces to portion and hand them in to everyone in turns. We are far from being able to keep up with the pace of Masai bites. Their teeth are definitely more suited for strong chewing and hard meat. I find it difficult to identify individual pieces of roasted goat served in the dark, but one of them is certainly an udder. It is impossible to chew and swallow it, so I discreetly put it aside in the grass to be ready before the next bite is served. Time for a soup. The lungs, stomach and excess fat will be mixed together and cooked in a pot over the fire. We get a massive one-liter mug of extremely greasy, hot and tasteless broth, which although is a real treat for the residents of the village, we drink a quick as possible to shorten the time of “savoring”. At the conclusion of the ceremony, one of the Masai picks out one of the goat’s eyes from its head and seeing my interest, he starts posing for pictures and laughing. Pure Masai sense of humor. Ashe means thank you. In the morning we say goodbye to all our great hosts, leave some gifts, thank in Masai and head towards the Indian Ocean.